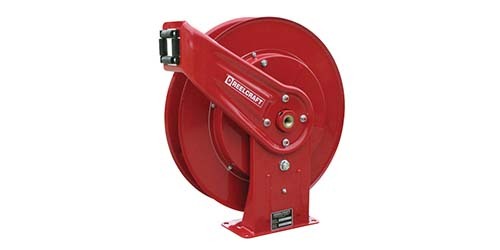 High Pressure Hose Reels – Reelcraft Industries, Inc. Hose reels prevent dragging and getting caught and tangled with other hoses or cords; both actions could easily kink or damage the hose. Such hose trauma could cause a drop in pressure, which compromises performance and worker safety, rendering the hose completely useless. By neatly winding the high pressure hoses on a reel, the hose life is extended and performance improved. High pressure hoses are used in many different industrial applications, including components in pressure washers, and are mostly parts of larger equipment or machinery. Those that stand alone, however, are most likely to use a hose reel. 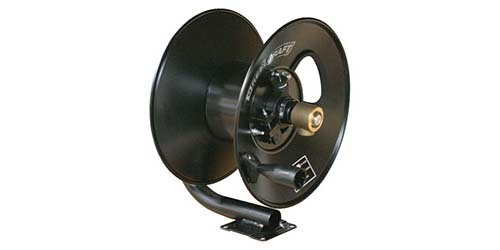 The most common and well known application for a high pressure hose reel is a reel for fire department hoses, as well as industrial cutting hoses and hoses that power manufacturing tools. Besides air and water, some high pressure hoses carry heavy liquids like grease and hydraulic oils. Some of the many advantages of high pressure hose reels include their ability to save time and encourage efficient and safe operation. In addition, most are calibrated to automatically retract high pressured hoses when not in use and require zero winding. Since high pressure hoses tend to have a large diameter compared to other cords and hoses, the reels are designed to be quite large in order to allow the maximum number of feet to be wound onto the reel. If the hose is used by employees that are often carrying other equipment and instruments in addition to the hose, then a motor or spring driven hose reels is the best option because they are both able to wind automatically. For those that don’t, a crank wound reel works fine. Most high pressure hose reels, however, are designed to mount horizontally on the ceiling or floor. The high pressure hoses are made out of thick, sturdy materials like plastic or rubber; the strongest have spiraled wire cores with rubber coating. The reels are large and often made of corrosion and chemically resistant metal like stainless steel. They also have an adjustable drag to prevent the hose from spinning off the reel when being pulled on. High Pressure Hose Reels High pressure hose reels are specifically designed to hold pressurized water and air hoses used for industrial processes and manufacturing operations. In order to function properly and safely, hoses with pressure must be in perfect condition.